All-in-One in this case means a 4-in-one car seat, with four different configurations. All the color/pattern options, quality fabric and adjustability make it a nice-looking, versatile seat that easily adapts to each stage of your child’s life and your lifestyle. The two cup holders have solid bottoms so kids can have their snacks and drinks close by while on the go – something that will come in handy as you child gets older and you hear, “Mom, I’m hungry!” more often. They’re roomy enough for storing crayons and small toys too. Plus, they’re easy to remove for cleaning. Most parents think the cover is easy to take off. It’s machine washable and drip dry. It’s not one solid cover (3 separate parts), so you can remove just the part that needs cleaning most. There’s also a removable body/head support cushion for newborns. It’s washable too. Like other convertibles, it will not serve as a portable infant carrier, nor will it fit on strollers. It’s meant to stay in the car at all times. The good thing is you don’t have to remove the harness when switching to booster mode. You just tuck the harness in the built in cubby, although the compartment is a bit small. Converting to backless booster is really easy too. What are the child size limits of the Graco 4ever All-in-One Convertible Car Seat? We were pretty impressed with the 40 pound weight limit to allow for extended rear-facing. Most other convertible seats top out at 30 to 35. The size limits can get a little confusing, so keep your manual in the car for quick consultation. 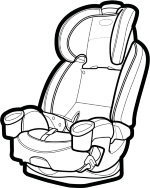 Rear Facing: Ideal for children between 4 and 40 pounds; height limit is when the child’s head is one inch below the headrest adjustment button when the headrest is fully extended. Front Facing: Ideal for children between 22 and 65 pounds, height should be less than 49”; child should be at least one year (12 months) old, preferably 2 years old or more. 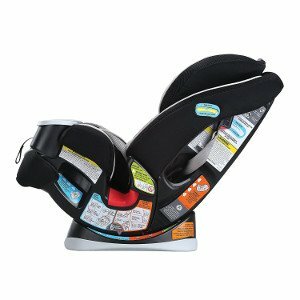 High-Back Booster: Ideal for children weighing between 30 and 100 pounds, height should be 38 to 57”; children should be able to hold themselves up in the seat and at least four years of age. Backless Booster: Ideal for children 40 to 120 pounds; recommended height is between 40 to 57”; and the child should be at least four years old. How big is the Graco 4Ever All-in-One convertible car seat, and will it fit in your vehicle? Convertible seats are often bulky, since they have so many jobs to do. If you have a larger vehicle like an SUV or hybrid, the seat will likely fit just fine unless you need to stick 3 car seats in the backseat. Then, you’ll want to measure your interior and compare it with the below measurements. For sedans and compact cars, definitely take measurements first. Some parents noted that there wasn’t much legroom left for the front passengers when this seat was in rear-facing mode, even on the minimal recline setting. How safe is the Graco 4Ever All-in-One convertible car seat? This seat has held up in real-life crash situations. One such experience occurred with an 11-month old baby involved in a terrible rollover accident. The baby was completely unharmed. This seat was crash tested only in the US, so if you’re outside the US, check with your country’s specific safety standards. Or call Graco to see if there is a specific model sold in your country. For overall safety, the 4Ever is a great option, including the ability to use LATCH in booster mode (up to 42 pounds). But there are a few things to note. When extended to full height, the seat can block some rear visibility depending on your vehicle, but it shouldn’t be enough to pose a safety risk. If you have a particularly small vehicle, make sure to get measurements so you can better determine if visibility will be a problem. Some smaller issues were noted that may affect comfort and peace of mind more than safety. A few parents thought the seat felt too loose in rear-facing mode and flopped side to side too much. Once the infant insert was removed, other parents felt the seat was too uncomfortable for their child. Some parents also noted that the fabric didn’t seem breathable enough, so their child was very sweaty after riding in the seat for a while. Useful tip: One complaint involved not being able get the harness straps to remain tight enough, which seems to be a recurring issue in Graco convertibles. But here’s a useful method some parents use to overcome that. Make sure to pull up all the slack in the harness in the hip area first, then pull out the slack in the harness behind the car seat BEFORE pulling the adjuster strap to tighten the harness. Also, tighten the harness BEFORE you buckle the chest clip. Note: The manufacturer states that the cup holders must remain in the car seat when in use. This is because the seat was not crash tested without the cup holders in place. Previously, we noted that some parents removed theirs to gain a couple extra inches of space in the backseat. Please follow all current manufacturer guidelines. How easy is the Graco 4Ever All-in-One convertible to install and use? The Graco 4Ever All-in-One is an easy seat to install in almost all modes. You may have a little more trouble fitting this one into a sporty car with bucket seats due to the width of the base. However, the belt paths are all clearly labeled and color coded so that you can figure things out without having to consult the manual every time. Unlike some Graco convertibles, the 4Ever All-in-One has only one set of LATCH straps for both rear and forward-facing, so you will need to switch the straps manually when converting. There is no lockoff device for seat belt installations, so you’ll need to know how your seatbelts lock, particularly if you have an older vehicle. To be on the safe side, consult your vehicle owner’s manual to see if there are specific instructions for car seat installations. For a lot of the conversion steps, it’ll be necessary to take the seat completely out of your car. This isn’t a complicated process, but it can be a bit of a pain. Make sure you’re not in a hurry when converting the seat from one mode to the next. 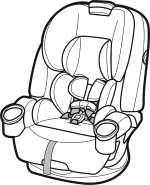 In rear facing mode, there are three recline positions (1-3) so that your baby can have the utmost comfort. The same goes for the front facing position (4-6), but position 4 must be used for children under 40 pounds. There is a bubble indicator on the seat that allows for easier leveling when installing rear-facing. The 4Ever CAN be installed with inflatable seat belts in certain models of Ford vehicles, but not all. If you have a Ford with inflatable seat belts, be sure to consult your vehicle manual and Graco to confirm if your model is compatible. There were a few notable usability issues. 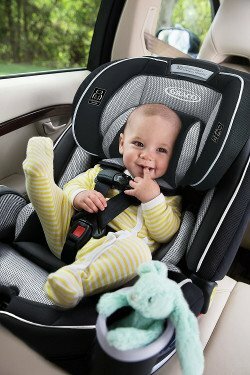 While the seat cover is removable in 3 parts, the harness straps are NOT removable, so some parents had issues with keeping the straps clean, especially after spit-ups and other smelly messes. Possible design flaw: One of the biggest complaints, which isn’t so much ease of use, but more a case of sanity, involves the headrest. According to several parents, it rattles. A lot. It doesn’t seem to pose any safety issue, however. The rattling seems to be worse the higher up the headrest is moved and when the car seat is empty. If this happens, Graco may be able to exchange your seat, but there’s no guarantee it will not rattle. This slip-proof, extra large seat cover is made with PVC leather. It’s water-resistant and will protect your vehicle seat from spills, keep crumbs out of the cracks and prevent markings on the upholstery. There’s also a 3-pocket compartment in the front for extra snack or toy storage. Keep the backs of your front seats clean and scuff free with these kick mats. Designed to provide a barrier against dirty shoes, they’re also a handy storage area with stretchy pockets to hold books, crayons, snacks, and mobile devices. Overall, the Graco 4ever All-in-One is a great choice for those who want a convertible car seat. Because it’s bulky and not portable and not the most comfortable seat on the market, we recommend this one for your everyday drives. 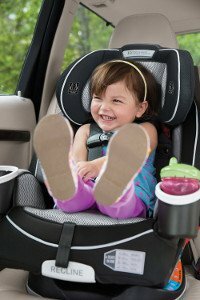 For longer car trips, your child would likely be more comfortable in a one-tasker seat that delivers more in terms of cushioning and portability. In the end, the Graco 4ever All-in-One is an affordable option that delivers on all values: safety, ease of use, functionality, price, and comfort. Yeah, it’s got a few issues here and there, but nothing that should compromise safety. As a convertible seat, it’s probably the closest to perfect we’ve seen yet. ❮ Warning: Recaro Optia with SmartClick Base fail crash test! Hello. Im wondering if the 4ever is better than Reclie n ride? Any thoughts? Hi Kai, thanks for your question. We haven’t had the pleasure of reviewing this seat yet. The Graco 4Ever has held the top spot on our list for quite some time. Yet, after looking at the Recline N Ride, it seems like the main difference is improved recline functions in both rear and forward-facing mode. It could be beneficial to get a better recline for newborns or for special needs kids who need a deeper recline angle in forward-facing mode. Due to the bulk of the seat and, however, it may not fit or completely recline in some vehicles, so we’d recommend finding a test model at a local retailer to try out before buying. Hi Gerry, thanks for your question. As far as we can tell, the only difference in the Platinum and regular Extend2Fit versions are fabric and design. We searched through customer Q&As for the regular version. No one specifically mentioned a Mazda 3 2015 model, but it did fit in a 2007 Mazda 3, a Mazda CX7, a 2013 Mazda 2, and a 2016 Mazda CX5. The best way to make sure is to measure your back seat dimension with the front seats where you normally have them and compare them to the dimensions of the car seat. Can you use the 5 point harness system with the car seat in High Back booster position? Hi Nicole, thanks for your question. According to Graco, the harness can be used in high back booster mode until the child is 65 pounds. After that, you must use the vehicle seat belt with the booster seat. What is the difference between the All-in-One model and the 4-in-one model? Is it just a newer model or are there specific differences between the two? Many convertibles that say “All-in-One” do NOT convert to a backless booster. One such example is the Diono Radian 3R All-in-One. Can I buy an extra base for this car seat? I think it is important to be able to buy extra bases for less hassle. Also can this car seat fit in strollers? Hi Katie, the Graco 4ever is a convertible seat, and like all convertibles, it doesn’t have a separate base, so you can’t buy an extra one. Also, it doesn’t work as a detachable infant carrier, so it won’t fit into strollers. How do you think this one compares to the DLX 4 in one model? I saw they we’re releasing a new one, that actually has the seatbelt lock in that so many people complained about with this one. Do you think that would make it a better buy at that point? Here is the link of what i’m referencing. Hi Devin, thanks for your question. It’s exciting to see a new version of this releasing 12/26/18. It is a bit more expensive, but if you’ve had issues getting a secure seat belt installation in the past, especially in older vehicles with no seatbelt lockoff or LATCH, this should definitely be worth a try. We’ll certainly keep an eye on it and list it for a future review. I see that you said that the cupholders may be removed in order to get the car seat to fit better. In the manual, it states that the cupholders MUST be installed. Is there a safety issue if cupholders are removed? Hi Amanda, you should definitely follow what the manual states. They haven’t tested the seats without the cupholders, so that’s the only reason they state they must remain attached. We will update this information in our review. Do you know if anyone has been able to get 3 of these in an SUV (same row), 2 rear facing and 1 forward facing? The 4Ever 4-in-1 car seats are 24″ H x 20″ D x 21.5″ W and they weigh 22.75 lbs. Our car seats have not been tested in every vehicle available on the market but they are tested in compact, mid-size, full-size, vans and SUVs from different manufacturers, but they should fit in most vehicles. Not all vehicles will accommodate 3 car seats across. Please reference your vehicle owner’s manual for information regarding safe installation of car seats in your specific vehicle, as well as the instruction manual for the car seat to determine how to safely install the seat. 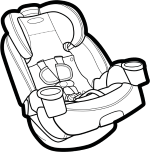 A copy of the manual for this car seat can be downloaded at the link below. You might be interested in our SlimFit 3-in-1 Car seats, which are one of our smaller models. They are 16.25” D x 19.88” W x 25.5” H and it weighs 19.5 lbs. You can see these on our website at the link below. Please visit our website for information about all our products. You can also call Graco Consumer Care at 1-800-345-4109. Hello, I have heard there are Safety ratings for car seats on a 3 point scale but I don’t see the rating for this on the Greco site or Amazon. Does anyone know why? It seems like a very important way for parents to assess and compare options. Most safety/performance ratings you’ll find are measured under independent research through organizations such as the NHTSA which has a 5-star ease-of-use scale. This, we feel, is the most important measurement because an improperly used car seat can be almost as dangerous as none at all. Generally, the easier it is to firmly install the seat and secure the child, the safer your child will be. will this fit in a mitsubishi rvr 2018? Does this car seat have extra bases that are sold separately? Hi Melanie, thanks for your question. The Graco 4ever, like most convertible seats, does not have a separate base. It’s built into the seat. It can’t be used the same as an infant car seat that detaches into an infant carrier. We just installed our car seat yesterday. I have tried to look online but can’t find an answer to my question. inside the box was a bag that had the two cup holders to attach, the instruction manual and a black strap with a red piece on the end. What is this strap for? I didn’t see anything about it in the instruction manual and can’t find anything online. My husband and I are having issues tighting the harness. Is it because it’s new so it needs to get worked alittle bit or is something wrong? Hi Chantelle, thanks for your question. Others have also had that issue, which seems to be fairly common in Graco convertibles. One helpful method that some parents suggested was to make sure to pull up all the slack in the harness in the hip area first, then pull out the slack in the harness behind the car seat BEFORE pulling the adjuster strap to tighten the harness. Also, tighten the harness BEFORE you buckle the chest clip. Try that, but if it still doesn’t work, call Graco customer service at 1-800-345-4109 to see what they suggest. However, we don’t recommend adding any aftermarket items to a car seat. They may not be crash tested, and they could void your warranty. So, before you do anything else, we recommend that you call Graco Consumer Services at 1-800-345-4109 Monday-Friday 8am-5pm EST. They are usually very helpful and may be able to offer a replacement part or return. Is there an easy way to take the car seat out and leave a base in or is it all one piece? I have babysitters that I leave my son in the car seat when he gets dropped off. 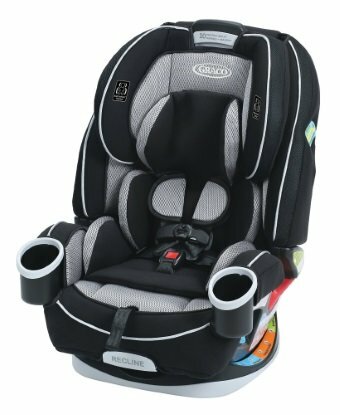 Would I have to take the whole seat itself out if my car or does it click in my graco click connect car seat hes in now? Hi Katherine, thanks for your question. The Graco 4-ever 4-in-1 convertible car seat does not have a detachable base. It’s all one piece, so to move it from car to car, you will have to move the entire seat. Hope this answers your question. I have twins so I’m not sure if I can fit two of these in my backseat with my older child’s booster seat. Like most car seats, it will depend on your car’s interior. Many parents can fit 2 side by side in cars such as a Honda Civic or Rav4, but don’t have room for any other passengers. If you have a large vehicle like a crew cab pickup, it’s probably possible. Take some measurements and call Graco to check if your car will be compatible. Can I put this seat on a stroller? No. As a convertible seat, it’s not portable like an infant seat. It’s meant to be used in the car only. If you’d like one for a stroller, the Graco Click Connect infant seats would fit most every Graco stroller. What do you mean by “make sure you tighten the harness to fit before buckling your child in”? I’m having trouble getting the harness tightened properly in rear facing mode.